Vittoria Musa was born in Fasano (BR) on 12th of April, 1994. She studied at Politecnico di Bari where she obtained the Bachelor Degree in Electronics and Telecommunications Engineering in September 2016, and the Master Degree in Telecommunications Engineering in October 2018, both with honors. 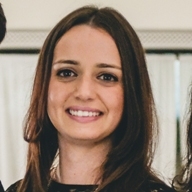 Since November 2018 she is a Ph.D Student in Telecommunications Engineering at the Department of Electrical and Informational Engineering (DEI), Politecnico di Bari.